In football there's a type of playing style called the West Coast offense. Basically, it puts an emphasis on passing and finesse, especially short horizontal lobs, in the hopes of stretching out the opposing team's defense. Done with the right players it makes for a beautiful game. 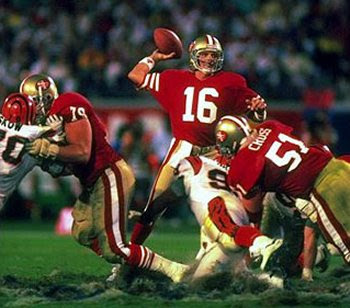 Just check out the highlight reel of those quarterbacks known as masters of the West Coast offense--Joe Mantana, Steve Young, and Brett Favre--and you won't be disappointed. There is, of course, a downside to this often dazzling style. Big plays means big risks. This brings me to two relatively recent purchases: American Capital Agency Corp., and Apollo Investment Corp. I grouped them together for this post for two reasons. 1.) They are similar companies both in size and scope, and 2.) I bought them primarily for the dividends. AINV currently offers a 10.40% dividend, while AGNC gives out a whopping 19.60%. Why the big payout? Well, in AGNC's case, it principally invests in REITs and other kinds of mortgage-related securities. You know, the little things that all but destroyed the world economy two years ago. It carries with it a staggering degree of risk, and for this it pays out a nice dividend. But does that make it worth it? Well, ask Joe Montana and Jerry Rice whether the Immaculate Reception was ultimately worth it. Sometimes it pays to make bolder, riskier moves down the field in hopes for faster results. I only own a few shares in AGNC, but its last dividend payout was $1.40. Even if you only own one share, you would get your trading fee back in probably less than one year, satisfying the Big Rule I mentioned earlier. From then on, you could count on receiving a nice dividend every quarter, which would help offset other trading fees you might accrue from other purchases. It may seem small and inconsequential, but if there's a way to make your trading cost-free, why wouldn't you do it? You don't need to acquire too many stocks like AGNC, and in fact I wouldn't recommend that, but they do help give you a little cash cushion to pad out your account. Sometimes it can take years to see any real returns on an investment, so it's nice to get a stock that can give you a quick spurt of results. But, if risk to you is more desirable than a last minute touchdown that wins the game, than a stock like AGNC may be perfect. What would, say, a $1000 worth of this 2008-founded company, do for you?